Other languages: See Doc. 4 for the biography in other languages (documents are accessible by accredited media and TIES users only). Dr Touré’s long experience in the Telecommunications Sector in both Public and Private Sectors, as well as in International Organizations including in the ITU makes him the perfect candidate for the Post of Secretary-General of ITU to spearhead the Organization’s future in the implementation of the WSIS resolutions and the Millennium Development Goals. This experience provides him with a solid platform to put in place systems that can effectively address the staff and Membership concerns while keeping a human face for the Union. His dynamic management style, warm relation building character and transparent way of conducting business will no doubt be useful in making the ITU an innovative, forward looking Organization adapted to meeting the challenges created by the new ICT environment. Dr Hamadoun Touré holds a Masters Degree in Electrical Engineering from the Technical Institute of Electronics and Telecommunications of Leningrad (LEIS, USSR) and Doctor of Philosophy Degree (PhD) from the University of Electronics, Telecommunications and Informatics of Moscow (MTUCI, Russia). Dr Hamadoun Touré has been progressively occupying strategic positions over the past 26 years in the Technical, Operational, Marketing and Management fields. His work has been facilitated by his ability to communicate effectively and persuasively. His proficiency in five languages including three official languages of the Union, his cultural sensitivity, as well as long and rich working experience built in both private and public sectors make him the most suitable candidate to steer ITU into the information society. Dr Touré was first elected Director of the Telecommunications Development Bureau (BDT) of the International Telecommunication Union at the Plenipotentiary Conference in Minneapolis (October 1998). As Director of the BDT he had the opportunity to plan and implement development strategies in accordance with the decisions taken at the Valetta World Telecommunications Development Conference (WTDC-98). He made significant contributions to transforming the Regulatory environment and cultivating a new type of relationship with the Private Sector and succeeded in creating result oriented Public-Private Partnerships aimed at mobilizing more resources for the development of the information and communication sector. Dr Touré’s contribution was rewarded with his re-election as Director of BDT at the Marrakech Plenipotentiary Conference (October 2002). His re-election gave him the unique opportunity to supervise the implementation of two action plans, i.e. Valletta and Istanbul Action Plans, and to spearhead the adoption of a third Action Plan by the Doha World Telecommunications Development Conference (WTDC-06). In his current position he has played a significant role in the World Summit on Information Society (WSIS) process by way of launching numerous projects based on partnership building with International Organizations, Governments, Civil Society and the Private Sector. Dr Touré’s initiatives with the National Regulatory Authorities and his actions with the Private Sector have played a catalytic role in stimulating the telecommunication environment in an all inclusive and win-win manner. Dr Touré moved to ICO Global Communication as Director General Africa Region to drive the new technological phenomenon - the Global Mobile Personal Systems (GMPCS). As Director General, Dr Touré spearheaded all strategies for the introduction and successful implementation of the GMPCS in Africa. He was responsible for overseeing all Regulatory, Technical, Business Development, Marketing and Pricing matters. He held the posts of Engineer, Regional Director Africa and Group Director Africa and Middle East where he was responsible for managing and implementing the sales and marketing strategies. During his over 11 years in INTELSAT the growth of Satellite Telecommunications in Africa and Middle East was phenomenal. 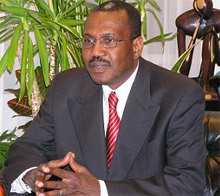 Dr Touré directed and undertook a number of feasibility studies mainly focusing on the introduction of new technologies. He managed the region at the time when of Internet and new digital technologies were being introduced in Africa. He successively held the positions of Engineer, Head Engineer and Technical Manager Bamako International Satellite Earth Station. He was also Manager of the International Satellite Telecommunications responsible for the coordination of international circuits. Dr Hamadoun Touré has proficiency in three of the official languages of the Union. He speaks, reads and writes French, English, and Russian in addition to his native Songhai and Bambara. Dr Touré’s main hobby is Afro-Cuban music and has been practicing Martial Arts for over thirty-five years. Member of the Institute of Electric and Electronics Engineering (IEEE) since 1986. Member of the Association of Satellite Professionals since 1990.